Acquire the practical knowledge needed to excel in the challenging field of criminal justice. The need for ethical and professional criminal justice practitioners is greater than ever in today’s society. As you earn your criminal justice administration degree online with Alvernia University, you can prepare for a rewarding career in the field, such as a police officer, correctional officer, parole officer or private sector security. Through our well-established program, you’ll gain the theoretical and practical knowledge and experience you need to excel. While learning from faculty with vast experience in the varied fields of the criminal justice system, the program’s online format gives you flexibility to study on your own time. With an interdisciplinary design, our online criminal justice degree will provide you with a strong foundation in the fundamentals of criminal justice. Our program also requires completion of a practicum course, in which you will gain relevant, hands-on experience through an internship on the local, state or federal level at a criminal justice, private corporate security or service agency. The online criminal justice degree is made up of a total of 123 credits. 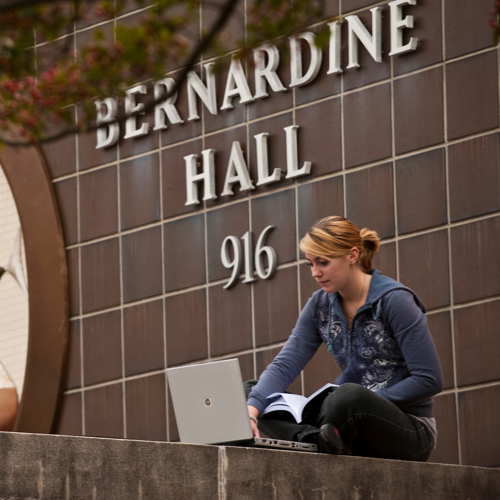 The Liberal Arts Core makes up 31 to 55 of the program’s credits, and the major requires 48 credits, including an elective course in criminal justice. Introduction to organization, administration and operation of the criminal justice system in the United States, with a broad view of interrelationships of police, courts and the correctional process. Major problems discussed include constitutional guarantees, conflicting purposes, mutual support and a view of recommended reforms. CJ 101 is a prerequisite for all other courses in the major. This course examines classical and contemporary theories of crime, nature and causes of crime and criminal behavior as well as relationships between law and crime. Emphasis is placed on identifying various criminological theories and their advocates to give students an overview of the various theories posited as causes of criminal behavior and crime. Prerequisite: CJ 101. Study of criminal offenses by statutory and common law definition/ classification; laws of arrest, search and seizure; and analysis of constitutional and statutory concepts governing introduction and use of information in formalized legal proceedings. PA Crimes Code is used as supplemental text reference. Prerequisite: CJ 101. This course reviews diversity in general as it relates to gender, race and crime. During this course, the history and contribution of equity issues are examined as they relate to contemporary diversity themes. Racism, stereotypes, gender discrimination, sexual harassment and role barriers are explored. The course focuses on the role of gender and race in the Criminal Justice system as it relates to victims, offenders and professionals. This course fulfills the Human Diversity requirement. Prerequisite: CJ 101. This course is designed for students in the Criminal Justice field to develop proficiency in writing constructively, major specific. It focuses on acceptable scholarly writing as well as investigative report writing, information gathering, report composition, note taking, case history reports, research and grant proposals used by the Criminal Justice profession. This course meets the Writing Enhanced requirement. Prerequisite: CJ 101. Introduces students to fundamental issues associated with the application of scientific methods to criminal justice problems. Topics covered include research design, the relationship between theory and research, types of research methods, ethical considerations, and data analysis techniques. Prerequisite: CJ 101, 102. This course examines the correctional field covering incarceration, probation and parole, modern correctional counseling, philosophy, practices, theories, system components, specialized programs, innovative sentencing, training issues, supervision techniques and standards. Prerequisite: CJ 101. Explanation of the role of the judiciary, its historical background and development in the United States with stress on due process of law, and the judicial procedure by which an arrested offender enters the system. Problems of change and reform of the process are also discussed. Prerequisite: CJ 201. This course emphasized development of skills needed for professional settings. Outcomes of the course include a resume, analyses of jobs available in the field of criminal justice; team building; individual oral and written presentations; completion of required background clearances and an evaluation by an interview panel. Prerequisites: CJ 101; junior status. Nature and extent of delinquency is discussed. Explanatory models and theories of juvenile delinquency are presented. History, philosophy, and evaluation of juvenile court practices and procedures are presented including the role of the juvenile officer. Prevention and intervention programs and their techniques are illustrated. Prerequisites: CJ 101 and 102. Examines challenge and conflict between professional standards of behavior and the acceptable system within the organization. Roles of Inspector General and Internal Affairs are presented. Issues concerning dual relationships, corruption, perjury, false reports, gratuities, wrongful acts, and code of silence are discussed. Civil Rights and brutality, and use of deadly force are viewed as ethical concerns. Honesty, integrity and ethical behavior in criminal justice professions are key themes in the course. Prerequisite: CJ 101. This course will address current issues in the field of criminal justice. This course is offered to broaden the student's experience, as well as assuring advancements and changes in the field has a mechanism to be addressed within the program structure. Course may be repeated for credit with different topics. Depending on the issue(s) identified, this course can be utilized as an elective for the Criminal Justice Tracks. Prerequisites: CJ 101; junior status. Actual involvement in an internship designed to broaden educational experience through appropriate observation and assignment with criminal justice, private corporate security, and service agencies on the local, state, or federal level. It is the responsibility of the student to locate and secure the internship placement. Prerequisites: 2.0 GPA overall, 2.0 GPA in major, senior status (90 or more credits), background clearances, CJ 102, 201, 221, 350. Encompasses an overview of crisis as it affects law enforcement officials and the criminal justice system, including dealing with suicidal individuals, barricaded subjects, hostage takers and their hostages. Psychological and behavioral profiles of perpetrators and victims are discussed. Protocols for dealing with the several identified issues are presented. Students will participate in classroom scenarios and exercises designed to incorporate the material presented. Prerequisites: CJ 101, 201, and 217, senior status or permission of instructor.